Raccoon problems are an unfortunate problem for an increasingly large number of residents here in Dallas. They’ve become almost dependent on rifling through trash for food, which brings them too close to our homes and businesses for comfort. Though we recommend calling a professional if you have a raccoon infestation on your hands, there are measures you can take to help keep them at bay. Raccoons are most active in the evenings and at night because they prefer working in the darkness. By simply installing a motion activated spotlight or leaving the porch lights on at night, you’ll discourage raccoons from coming near your home. 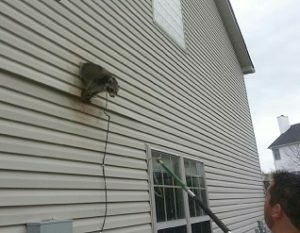 Raccoons are naturally spooked by humans, so placing a weather-resistant radio on your property at night that is set to a talk-radio station is actually very effective for deterring them. Don’t worry about the radio causing a disturbance either, it doesn’t need to be loud to be effective. Because raccoons have great dexterity with their paws, they’re able to get into most garbage cans with ill-fitting lids. Cans are available with locking lids to keep the furry critters out, or you can place something heavy like a large rock or cinder block on top as a deterrent. In addition to food, raccoons need a source of water that’s easily accessible. If you have any pet bowls outside, consider bringing them indoors to help ward off any unwelcome visitors. Also check for standing water or leaky garden hoses. Eliminating food and water sources is the best way to prevent a raccoon issue. If you’re dealing with raccoon issues on your property, we strongly advise against attempting to remove them on your own. Take the steps above to help keep them away, and call the raccoon removal experts here at Critter Control® of Dallas at 817-222-1101 today.